Martin Bormann (17 June 1900 – 2 May 1945) was a Nazi Party official who during the later years of World War II became a very powerful man serving as the private secretary of Adolf Hitler. He controlled both access to Hitler and the information which Hitler received. Hitler also appointed him the head of the Nazi Party Chancellery (Parteikanzlei). 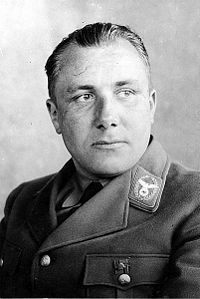 Bormann gained many enemies over the years, including Heinrich Himmler and Albert Speer. In the latter years of the war, he was considered Hitler's "right-hand" man. Bormann was a dedicated atheist and wanted to wipe out Christianity in the German Reich. Bormann declared, "More and more the people must be separated from the churches and their organs, the pastors." He was born in Prussia, Germany. He attended high school for one year and then dropped out. He serviced in an artillery regiment late in World War I. After the war, he joined a Freikorps unit to fight German communists. He took part in the murder of a communist who allegedly reported on Freikorps sabotage to French occupation officials. For his part in the murder, Bormann served a year in prison. Bormann joined the Nazi Party in February 1927. In September 1929, Bormann married the daughter of an early Nazi Party official. Hitler attended the wedding. Bormann was made a Reich Leader (Reichsleiter) of the Nazi Party on 10 October 1933. The following month, he became a member of the Reichstag. In 1939, Hitler turned over control of his personal finances to Bormann. From July 1933 until May 1941, Bormann served as the personal secretary for Rudolf Hess. On 10 May 1941, the flight by Hess to Britain, in the vain hope to negotiate peace, cleared the way for Bormann to take his place. Bormann was appointed the chief of the Nazi Party Chancellery on 12 May 1941. In that position, he had control over the appointment of Nazi Party positions and over handling the affairs of the Party. Bormann proved to be a master of climbing the ladder of the Nazi Party and his ruthlessness allowed him to gain much power from May 1941, forward. Bormann gained control over the setting of Hitler's appointments, access to Hitler and the flow of information he would receive. On 12 April 1943, Bormann was officially confirmed in the position he had already been performing as "Personal Secretary to the Führer". Hitler typically only gave verbal orders. As Hitler's private secretary, Bormann would convey Hitler's orders to others in writing, by phone or telex; at times, Bormann would issue his own orders in Hitler's name. Bormann had Hitler's trust and remained loyal to him until the end. Trapped with Hitler in the Berlin Führerbunker in late April 1945, Bormann was named to head the Nazi Party. During those final days of the war, Bormann convinced Hitler to remove Hermann Goering from power. On the night following Hitler's suicide of 30 April, Bormann left the Führerbunker as part of a group attempting to break out from the Soviet Red Army encirclement of Berlin. He did not make it and committed suicide on 2 May 1945. Bormann was convicted "in absentia" by the allied Nuremberg War Crimes Tribunal as a war criminal in 1946. In 1972, due to construction in an area of Berlin, some human remains were found. By DNA testing in 1998, a skull was conclusively confirmed to be that of Martin Bormann. Bormann was known as a ruthless and cruel man. A dedicated Nazi, he was vehemently against Christianity and believed it was "incompatible" with Nazism. During the war, he pushed for attacks on the Christian churches which resisted Nazism. He also pushed for the killing of Jews. After the war, he wanted Hitler to completely crush the Christian churches and their leaders. ↑ Hamilton, Charles. Leaders and Personalities of the Third Reich, Vol. 1 (1984). ↑ Snyder, Louis. Encyclopedia of the Third Reich (1994) . ↑ Miller, Michael. Leaders of the SS and German Police, Vol. 1 (2006). This page was last modified on 9 April 2019, at 12:14.